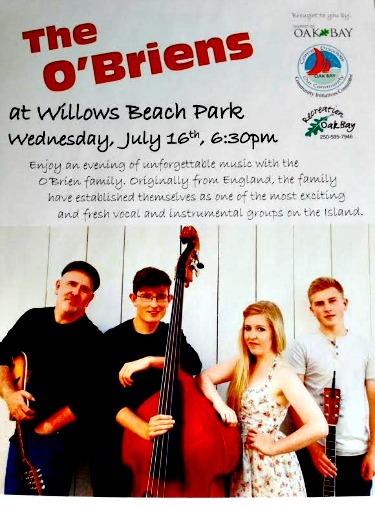 Wednesday evening The O'Brien Family will be performing at Willows Beach park starting at 6:30pm. Originally from England the family have established themselves as one of the most exciting and fresh volcal and instrumental groups on Vancouver Island. What a treat this will be! Bring a blanket and watch the sunset...enjoy it all here in Oak Bay. Let's go... Located on the corner of Dalhousie and Beach Drive. Lots of parking available as well.